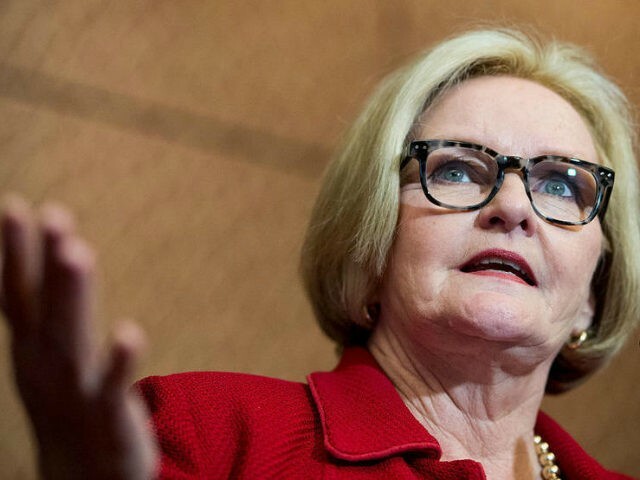 Sen. Claire McCaskill (D-MO) slammed Hillary Clinton for her recent comments about Americans who voted for President Trump, warning the former presidential candidate that she should be “more careful” in talking about those voters. “For those of us that are in states that Trump won, we would really appreciate if she would be more careful and show respect to every American voter and not just the ones who voted for her,” McCaskill said in an interview with MSNBC Sunday. Clinton made the remarks at a conference in Mumbai, India, this month, saying that the areas of the U.S. that are “looking forward” while Trump’s Make America Great Again campaign was “looking backwards,” suggesting that Trump ran a campaign targeting racists and misogynists. ”If you look at the map of the United States, there is all that red in the middle where Trump won. I won in the coasts, I won in Illinois, in Minnesota, places like that,” Clinton said. “But what the map doesn’t show you is that I won the places that represent two-thirds of America’s gross domestic product. So I won the places that are optimistic, diverse, dynamic, moving forward, and his whole campaign, Make America Great Again, was looking backwards,” she added. McCaskill said she was particularly irked by Clinton’s comments because the former presidential candidate criticized her constituents. Since Clinton made her remarks, the Missouri Democrat is attempting to distance herself from the 2016 Democratic presidential nominee’s remarks to try and recover from trailing poll numbers in her upcoming re-election bid. A Survey Monkey poll released in March showed that McCaskill’s Republican challenger, Josh Hawley, is leading in the polls with 52 percent of likely voters favoring him over the 44 percent of likely voters favoring McCaskill.